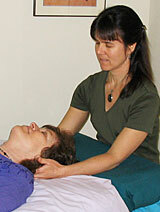 Beeara received her certificate in Biodynamic Craniosacral Tharapy in August 2001 at the Colorado School of Energy Studies in Boulder. This certification program is a 2-year, 700- hour training course based on the teachings of Franklin Sills. She went on to complete the training a second time in August of 2003 and again in March 2013 as a teaching assistant. Beeara has also taken two advanced workshops for working specifically with infants. This can be very effective in helping alleviate many of the challenging symptoms that babies can face, such as difficulty sleeping, breastfeeding issues and digestive challenges. It has been recommended by doctors who work with tongue tie issues for the newborn to receive treatment before and after medical intervention. There is no doubt that that your treatment allowed me to access internal comfort and relaxation despite severe injuries. I found each treatment to be a step in the healing process, each time a new door opened that allowed flow of energy and peace. As a Chinese medical practitioner I can equate that feeling of peace and energy flow with smooth qi flow; as a wounded human being, I can equate it with healing touch.